Charmant chalet situé en face de Corn Hill Beach Truro Cape Cod Bay. Enthousiaste, ensoleillé et tranquille. Écoutez les vagues de votre chambre à coucher. Deux chambres avec lits queen size dormir 4 confortablement, salle de bain avec douche, cuisine et salon avec cheminée. La longue plage pittoresque dispose généralement calme, les eaux plus chaudes, et les vues et les couchers de soleil sur l'eau sont spectaculaires. A proximité des pistes cyclables et Castle Hill Center for the Arts. Provincetown, avec ses nombreuses attractions et restaurants se trouve à seulement quelques minutes en voiture. Definitely quiet. Definitely cozy. Definitely not handicap accessible. Definitely not queen beds. We made the best of it as we were faced with A number of things that were not what they were represented to be in the ad. Sweet and eclectic. Internet and cable worked as did the appliances. Would have been happy to try to accommodate you if I had been given more information. 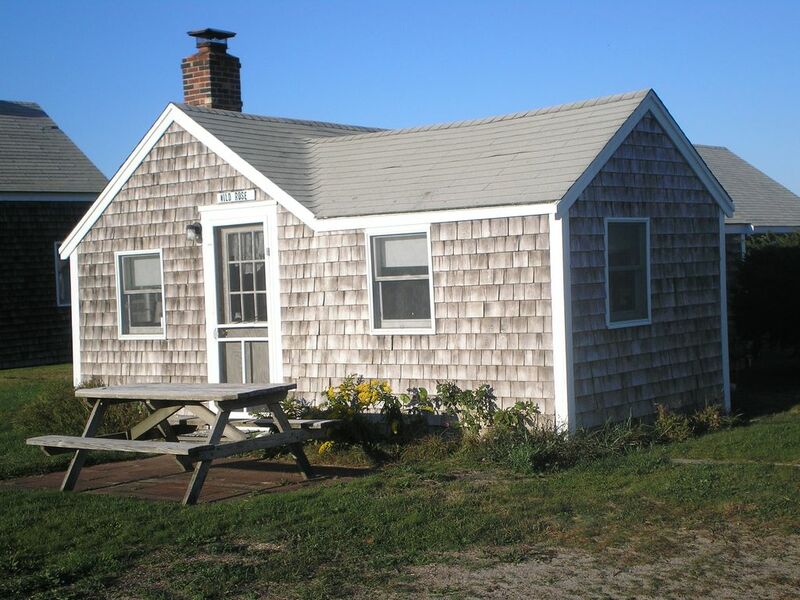 Unfortunately, this is an older Cape Cod cottage not easily renovated for all needs. We had 1 queen bed and 1 double. Now, we've changed it to 2 queen beds thanks to your suggestions. I hope you still had a good experience in Truro. Thank you very much. We have also taken off the note stating that the property is handicap accessible. Just returning home from such a wonderful, wonderful week at the wild rose. The location, you just can’t beat. The beach is directly across the street which made it so easy for us to do beach trips with the kids and come back easily for nap time. So many great nights watching the sun set. The cottage is so charming, no frills and exactly what we envisioned for a cape beach cottage get away. Right on the BEST beach! Lovely cozy little cottage with fireplace. 2 bedrooms plus a queen size futon. 10 miles from P-Town. Need I say more? I’ve stayed here for the past 5 years and absolutely love the cottage and its proximity to the beach. Linda is so accomadating with a personality plus! A fun week in the "Doll House"
Known locally as The Doll House this cottage offers everything in a small package. The one thing it doesn't have is air conditioning, don't let that scare you off, with the ocean breeze and supplied fans it was fine. So if you like the Outer Cape give it a try, it's a short walk to the bay side beach or a quick drive or bike ride to the ocean if some surf's your thing. Enjoy! We were charmed by the fire place, the out door shower, and roses painted on the ceiling. We were able to have a bonfire at Corn Hill beach. I've never seen such a sublime sunset. Best place we have stayed on cape cod!!!!!!!!!! Awesome location across the street from the beach. The owner Linda was super helpful and friendly. If you are tall the doorways are a bit small. Beautiful sunsets! Truro dispose de belles plages, la navigation de plaisance, pêche, golf, salle à manger élégante et décontractée, des sentiers de conservation, la rive National de la Mer, des galeries d'art, un centre colline du château pour les arts. Un court trajet en voiture est Provincetown avec ses boutiques éclectiques, des galeries, des spectacles de cabaret, pêche charte, croisières coucher du soleil, les dunes de sable sans fin, massage, un musée de pirate, le Musée Provincetown Art Association, le Pilgrim Monument. All rentals are Saturday (check-in time 2 pm) to Saturday (check-out time 10 am). Guests are responsible for bringing their own sheets and towels. Payments are non-refundable unless the property can be re-rented, in which case a full refund will be made.